Since 2010, sodium-ion batteries (NIBs) have been intensively investigated because of their cost and resource advantages and the application prospect in the large-scale energy storage system. However, the energy density of the current NIBs remains a serious challenge hindering its large-scale commercial application. Hard carbon is one of the promising anodes in the early commercial NIBs for their good comprehensive performance, e.g., high capacity (~330 mAh g-1), good cycling stability, high initial Coulombic efficiency, reasonable cost and abundant resources of precursor materials. Although extensive efforts have been devoted to the development of high-performance carbon anode materials, a consistent behavour in the discharge-charge curve are often presented with two distinct regions: a slope region above ~0.1 V and a plateau region below ~0.1 V. Usually, the plateau region exhibits a higher capacity than that of the slope region, and a high-capacity carbon anode often shows a large proportion of the plateau capacity, which could further increase the energy density of a full cell in terms of the average voltage to some extent. Therefore, designing and discovering a carbon anode with a large proportion of the plateau capacity can be a potential approach to increase the energy density of NIBs. Recently, the team of Prof. Yong-Sheng Hu at the Institute of Physics, Chinese Academy of Sciences (IOP-CAS) reported a bi-honeycomb-like architecture carbon material by carbonizing a kind of charcoal in a high-temperature graphite furnace at 1900 °C. This carbon anode shows a high capacity of ~ 400 mAh g-1, which is higher than the ~ 330 mAh g-1 capacity of current hard carbon materials. About 85% (> 330 mAh g-1) of its total capacity is derived from the long low-potential plateau below ~ 0.1 V, which differs from the curves of typical hard carbon materials of NIBs. 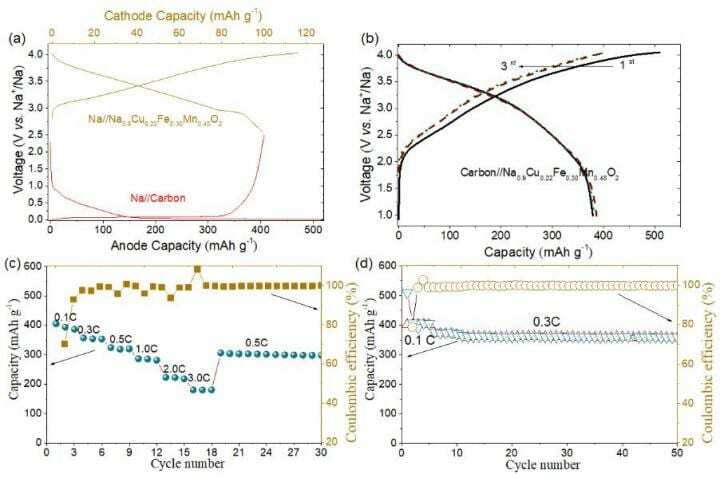 When coupled with air-stable Na0.9Cu0.22Fe0.30Mn0.48O2 layered cathode, a high energy density of ~240 Wh kg-1 was obtained with good rate capability and cycling stability. The discovery of this promising carbon anode is expected to draw the further improvement of high-energy density NIBs towards large-scale electrical energy storage. This work was supported by the National Key Technologies R&D Program, China (2016YFB0901500) National Natural Science Foundation of China (51725206, 51421002, 51232005, 51372131).